News media and Press Freedoms in Qatar is something that I have been wanting to write about for a while, but haven't been able to figure out how to express this in a balanced and fair aspect without making press freedoms seem like a large issue in Qatar. For the most part, though more restricted than the US, they are not much of an issue and most things (especially internationally) are not censored or restricted. However, from my perspective as an American, there definitely are some stark differences. Coming from the US, I often take my First Amendment Rights for granted, and the notion of a free and open press is not something that I contemplate frequently. Even with a free press, you always have biases and agendas in any news organization. Yet, there are a few things I saw in Qatar that definitely seemed almost alien to me and made me reflect on this First Amendment Right. Reporters Without Borders ranks Qatar 113 in the World Press Freedom Index (Report Available Here). However, news of that ranking was actually, immediately published right in one of the main Qatari English newspapers: Qatar Stumbles in Latest Press Freedom Index Ranking. So, even though press freedoms are lower ranked than other nations, the Qatari government is not controlling everything completely. There doesn't seem to be any issue with hiding that fact - which seemed surprisingly free to me. In general, this seemed to be the overarching narrative when describing press freedoms in Qatar. There are restrictions, but it isn't quite black and white. There are nuances and the ability to highlight them to some extent. It is not completely authoritarian controlled. His Highness the Emir, Sheikh Tamim bin Hamad al Thani, has sent cables of congratulations to the presidents of Croatia, Slovenia, and Mozambique on the occassion of their countries' national and independence days. His Excellency the Prime Minister and Interior Minister, Sheikh Abdullah bin Nasser bin Khalifa al Thani, has sent similar cables. His Excellency, the Prime Minister and Minister of Interior, Sheikh Abdullah bin Nasser bin Khalifa al Thani, has chaired the weekly Cabinet meeting held at the Amiri Diwan. Following the meeting, his Excellency the Deputy Prime Minister and Minister of State for Cabinet Affairs, Ahmed bin Abdullah al Mahmoud, said that the Cabinet considered the topics on the agenda and took the appropriate decisions. To any American, the wording in these bulletins always highlighted how scripted these news on the radio is in Qatar. Even though we rarely use titles in American English, if we did, we would probably never repeat a title when talking about the same man in two consecutive sentences. The mention of the weekly cabinet meeting also interested me as it was brought up, but no details were ever given. I always found that quite odd. That being said, the news did not censor much. Later in this same broadcast, he talks about "rebels", "insurgents", and "terrorists" in Iraq, which though definitely a subjective description, is no different than how many Western nations report on the news, and evident that there was no attempt to skip over events in the region. The news later discussed Parliamentary Elections in Tunisia that had occurred that day - which is important given that those were a direct outcome of the Arab Spring and that Qatar is still a Monarchy. In general, though the radio news broadcasts always seemed scripted and dictated by the government, they mostly left events outside of Qatar alone and only restricted internal news. Aside from News on the Radio, internal news to Qatar was also limited somewhat. For the most part, I never really noticed it, however, there was one occassion that definitely stood out. One day, there was a gas explosion near the Landmark mall. For a small, very safe country, a restaurant's gas stove explosion that killed a few people is a very big deal - and it was all over the news for a few days. Then, it was not mentioned anymore. About a month later, I came across this: "Shortly thereafter, Qatar’s Attorney General Dr. Ali bin Fetais Al Marri issued a media publication ban on all investigation-related reports." Articly available here. For about a month, none of the news outlets could report at all on the investigation, which is why I hadn't hear it. It was small things like this that made me notice the differences in press freedoms every once in a while. One other article I read one day really stood out to me about news in Qatar. It is an opinion piece (which in any publication anywhere can be very different than actual public opinions) which is not so much unique in the press freedoms, but in the bias evident in the article. Qatar is not frequently mentioned in international news, and currently in 2014, when it is mentioned, it is often in reference to the 2022 World Cup. This often comes with a mention of construction workers' working conditions (which I don't want to discuss here, right now - only to mention that much of the reporting doesn't capture that this is a broader issue in all sectors of Qatar's economy). As with most other things, the restrictions are surprisingly lax on reporting on this as well - especially if it has been mentioned internationally. After a particularly damning report by Amnesty International on Maids in Qatar, I came across this opinion piece: Opinion: Not Without my Khadema. Granted, a writer has to write for his or her audience, but phrases in this piece shocked me as it highlighted some of the biases within the country in general. The article tries to present a balanced article on an issue that is viewed by most Westerners as not needing to be balanced at all - there is a definite right and wrong. Sentences such as, "Do you allow her to use the internet?" or "When she takes the day off, is she allowed to do anything?" really stood out. Perhaps most indicative, "Do you force her to stay against her will, because of her contract obligation? What if she cannot pay you back the amount you have paid the recruitment agency?" Again, these are not so much press freedoms, but biases you see in the opinion pages that are unimaginable in most American's minds. I always wondered how much of opinion pieces such as this were actually reflective of the general readers' biases, or if this was actually a press freedom restriction where the article had to be written this way so as not to offend any potential censors. My guess is that it is a little of both. And finally, no discussion about news in Qatar is complete without mentioning Al Jazeera. Al Jazeera is headquartered in Qatar and was funded (at least initially) by the royal family. Like everything else I've mentioned here, Al Jazeera is very good at reporting objectively on international news, but you don't hear as much about Qatar itself. However, the reason I want to mention it here is that still today, it has journalists that are in jail in Egypt for political reasons that most of the world has condemned. Even though press freedoms in Qatar are repeatedly ranked very low, their main news outlet is still fighting press restrictions in other countries and seem to value press freedom in general. I am not sure how much this is discussed internally among the Qatari population, but it is definitely a topic that can be. 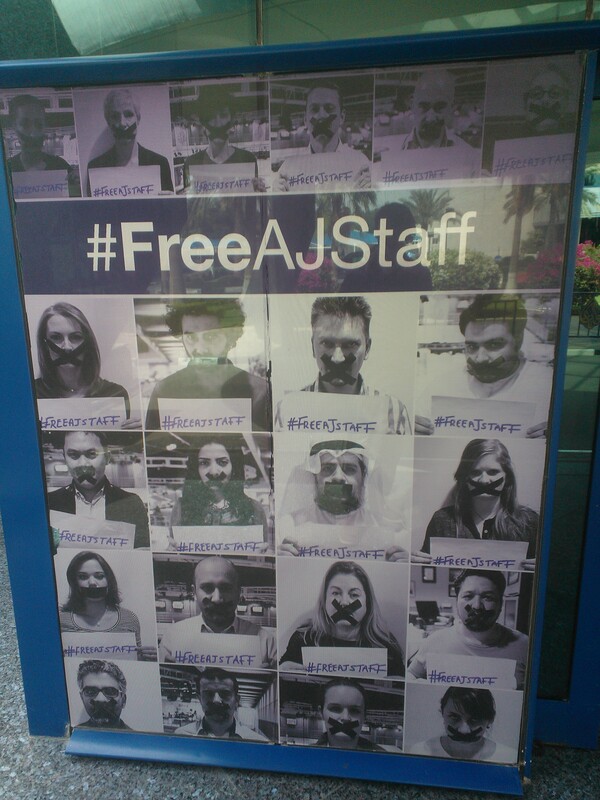 With that, I'll finish this with two pictures of the campaign to free the Al Jazeera journalists. 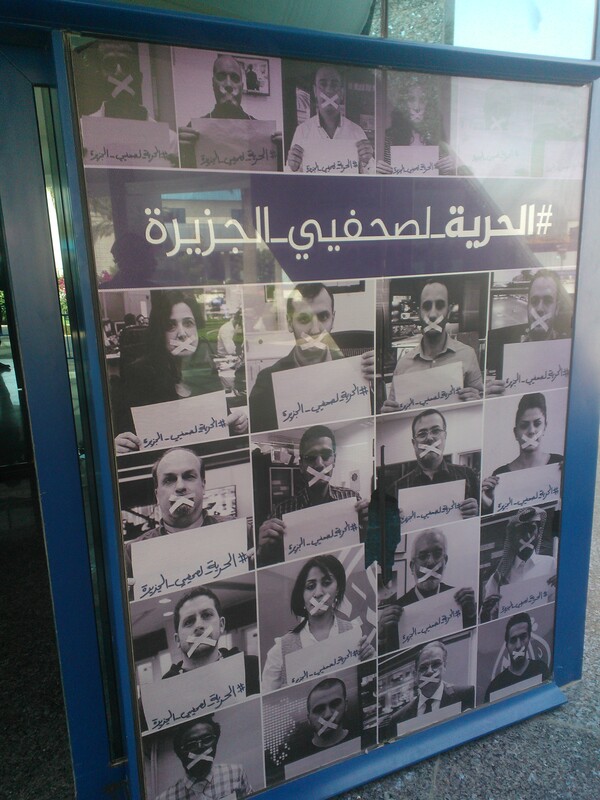 I took these photos inside the Al Jazeera compound, hanging on the main building.